Whenever you first install WordPress, one of the widgets that’s first displayed on the main page of the dashboard is the Other WordPress News widget (which actually used to be referred to as WordPress Planet). This widget has been present for as long as I can remember and is basically an aggregator of a number of different WordPress blogs. If you’re someone who spends the majority of their time working in the WordPress dashboard, it’s a solid option for making sure that you don’t miss a beat of news when working with WordPress. The thing, some have found that the feeds that populate the feed doesn’t do justice to the blogging ecosystem that exists within the WordPress blogging community. It’s not that the provided posts are bad, it’s just that they lack some of the new comers. In order to help give some of the newer, active blogs in the WordPress blogging community some exposure, Oli Dale of WP Lift has written a really neat plugin called A Better Planet. But the cool thing about this particular plugin is it’s approach to aggregating the news. 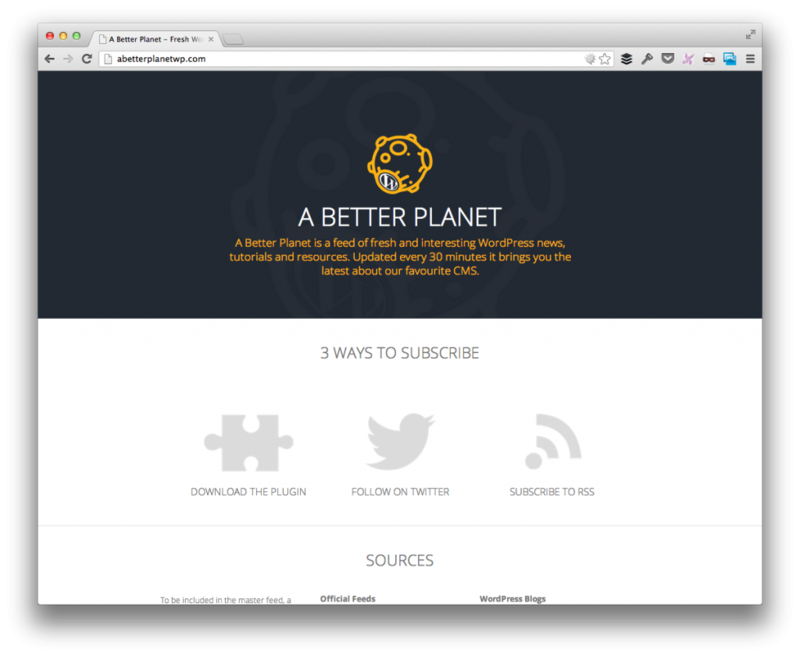 First, A Better Planet is a WordPress plugin that sits in your WordPress dashboard. It’s either meant to add to the existing feed or to replace it completely. Secondly, there’s also an RSS feed that you can use if you’re not into reading feeds in the WordPress dashboard. Third, there’s also a Twitter feed that you can follow that makes it really easy to track with the posts that are being shared within the dashboard or the RSS feed. Overall, it’s really hard to actually miss anything that A Better Planet publishes. Finally, props to Oli for putting something like this together. Aside from being a fan of the idea for the plugin itself, I really like the idea of offering three different ways with which users can connect with the data published by the plugin. Be sure to check out the plugin’s page and give Oli some props on Twitter for his work. Previous PostPrevious Should a WordPress Plugin Change Post Content?